The rainy weather didn’t put a damper on the warm and bright atmosphere of Bryce and Kyle’s July afternoon baby shower. The Hollinger’s relied on The JDK Group to handle their 2012 wedding, and we were thrilled to hear of their exciting news of expecting addition to their family! 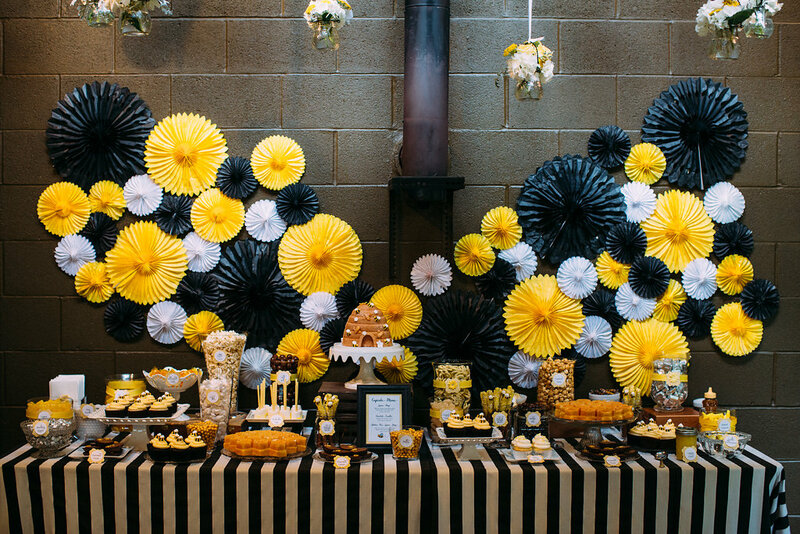 The theme of the shower, “Mommy to Bee,” matched the colors of the event, with yellow, white, and black décor covering the home of the soon-to-be grandma. 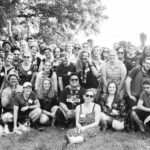 However, the party was not always set to take place in the home, as mother nature drove the party from the outdoor yard and patio to indoors. The JDK Group took on the challenge, transforming a traditional garage into a gorgeous banquet space in less than 24 hours. Flowers, yellow and white held in white ceramic vases, covered nearly every surface of the home from the food and gift tables, to the decadent centerpieces on each dining table. 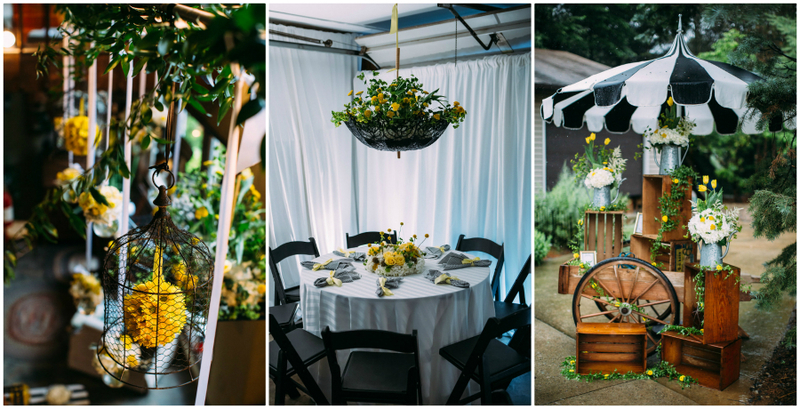 Yellow flowers held in mason jars hung suspended from the ceiling, accompanying suspended upside-down vintage black lace umbrellas that held elaborate floral designs pouring over the sides. Guests indulged in a full gluten- free menu, with favorites including made-to-order deviled eggs, an assortment of PA fresh farm cheeses, coconut encrusted chicken bites, and beef short rib brioche bite. On the sweeter side, a custom dessert bar created by Couture Cakery lined the wall under suspended flowers, where a bee-hive shaped cake stood as the centerpiece. Although the guest of honor had to enjoy the signature cocktail alcohol-free, guests enjoyed bee-inspired beverages of honey mint and lavender lemonade with honey syrup and other signature cocktails from the bar. Expecting their first two children, twin girls, the kitchen was transformed into an arts-and-craft space where guests decorated tiny bibs. Nearby, a table sat filled with pens and cards where guests wrote the expecting couple their best tidbits of advice for parenthood. We are overjoyed with the couple on their expecting new additions to their family, and it was a pleasure helping them celebrate such a special time in their lives.